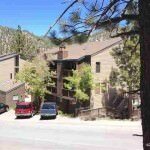 115 Tramway -12 #12 Stateline NV offered at $139,500Lowest priced Tahoe Condo having beautiful Carson Valley & Pine forest views. Private deck and porch with excellent cross ventilation control and great sun exposure. Excellent HOA: building, sauna & common areas well maintained. Newer oven range, granite tile counters, vaulted wood ceilings. Wood burning fireplace. Ten minutes to lake/casinos, 15 min to Carson Valley, seconds to Heavenly Ski lodges/lifts!! Great vacation, 2nd home and investment...Continue Reading!